Sound "Smooth, clear, and clean -- no, make that squeaky clean"; "the A32's bass is tight, detailed, and controlled, but this is not an integrated amp that warms things up excessively or is 'bloomy' in the bottom"; "high frequencies were simply pristine," and the "midrange editorializes not at all." 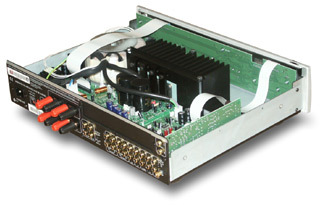 Features "Microprocessor controlled" unit that offers all the standard features of an integrated amp along with "a plethora of features selectable via the front panel and/or remote control"; 100Wpc output and standard Arcam build and circuit quality. Use Comes with a MM/MC phono stage that's removable; supports two sets of speakers; tone controls are included. Value "One of the finest audio values [Doug has] come across this year." The $2099 USD Arcam FMJ A32 integrated amplifier can be thought of as the big brother to the DiVA A85 integrated amplifier that Wes Phillips thought so much of last year. In ways, its also the successor to the FMJ A22 integrated amplifier. Although the A32 doesnt have some of the functionally of the A22, like the DAVE and MARC add-ons for home-theater and multi-room capabilities, it has enough features of its own that the Arcam people feel that it will be the top choice for consumers of two-channel equipment. FMJ stands for Full Metal Jacket, and it is the upscale product line from Arcam. The lineup was named at a time when the bulk of the companys products had primarily plastic faceplates. Thats not really the case anymore; the less-expensive DiVA line has metal faceplates now too. But the FMJ name is nifty and it stayed. The A32 is deceptively simple looking with its attractive 8mm-thick faceplate (available in black or silver) and its non-cluttered and sleek front panel layout. Dont be fooled, though; the understated elegance hides a lot of functionality and features. Arcam rates the A32 as 100Wpc into 8 ohms, 150Wpc into 4. The A32 is not a behemoth, but it offers more than sufficient power for the majority of the speakers on the market. I used the A32 with a number of speaker models I reviewed and none made it hiccup. There is an upgrade path through the P35 power amplifier, which comes in two- and three-channel configurations and allows the user to biamp speakers or turn the A32 into a home-theater or a multichannel-music control unit. The P35 can be connected to the A32 with a trigger cord so that when the A32 is powered on the P35 will come on too. If you need more than five channels of power, multiple P35s can be chained together. The A32 has all the necessary inputs -- CD, tuner, A/V, DVD, VCR, tape -- and it even has an MM/MC phono stage. The phono stage is the same as the one in the A85, but it is a $150 option there and costs you nothing here. If you dont have use for the phono stage you can physically remove the board and use the input for a line-level source. The menu options even lets you rename the input from Phono to Aux for the display (dont be fooled, though, into thinking simply renaming it will enable it or disable it -- you must actually install or remove the board inside). Installation of the A32 is simple. Plug the detachable IEC power cord into the receptacle and the unit powers itself up to standby mode. The main power switch is on the front, and when thats pressed, the A32 lights and up and youre in business. For a quick-and-dirty startup, simply select the speaker you hooked your cables to (the A32 supports two sets of loudspeakers, labeled SP1 and SP2), press the input you want to listen to, and adjust the volume knob to the appropriate level. Thats it. But theres more -- much more. Lurking behind its small lit-up window are a plethora of features selectable via the front panel and/or remote control. And the features are impressive, allowing the user to change the volume-control resolution to "standard," "fine," or "reference" (the latter being 0.5dB discrete steps); alter the volume control display to be either a numerical figure or a graphical gauge (I liked the numerical figure); work with the tone controls (which can be changed either globally or per source); adjust channel balance; even change your own power-on welcome message from the default to something more personal or perhaps more threatening, like "Do Not Touch This." The programmable feature I made the most use of is Input Trim. This allows fine-tuning of the volume for each input to compensate for differing output levels of source components. This seemingly small feature has the huge benefit of allowing you to flip through input sources and have all of them at the same volume level. No more having one blare at you while the other is quiet as a whisper. And for a reviewer, its wonderful because it allows level-matching sources for easy A/B testing. The functionality of the menu system is relatively straightforward, but, as with all things like this, some users may have a hard time with it. If youre still fearful of programming your VCR, you may want to get the kid from next door to come over and help you. For those used to such things, its pretty intuitive. I made good use of the manual, but there were a couple of times when it wasnt helpful and I had to simply work through the problem by gut feel. I got done what I needed to get done with only a few errors and a couple outbursts of anger. Therefore, I give A32's interface reasonably high marks for ease of use. The overall fitnfinishnfeel of the A32 also get high marks. One easy-to-overlook feature is the chassis cover, which is made from a laminated material called Sontech. It was originally developed for use in the auto industry to combat road noise. The benefits for cars are obvious: It makes for an exceptionally dead-sounding chassis that reduces resonance/vibration anomalies. When you pick up the 17"W x 15"D x 4 3/8"H A32, you realize its a rather substantial and solid piece. It weighs in at 24 pounds. The remote control is also attractive, and chock full of buttons that do most everything. Its implementation is also pretty smart. It works with other Arcam products, so if you press the play button for CD, the A32 will automatically switch the source input to CD. My only operational complaint is the cramped quarters on the back panel of the A32. Now admittedly, in order to keep such an attractively small chassis size, you cant have a back panel thats very big, and the gold-plated RCA jacks are spaced sufficiently for all but the most unwieldy of interconnects. However, I did find myself swearing as I tried to hook up my fairly thick spade-terminated speaker cables. I learned that the A32 is BFA compatible, and if I used those types of connectors, hooking up the A32 would have undoubtedly been easier. Arcam didnt cut many corners with the A32; they provided most features a potential consumer looking for high-quality two-channel sound could want. The only area in which they scrimped in my estimation is the A32's two-year warranty. This is a little short given that the industry standard seems to be five years for topflight electronics. My primary digital source for the review period was the companion Arcam FMJ CD23T CD player -- every bit the equal in terms of performance, build quality, and appearance. I also used my Theta Data Basic transport to feed the marvelous Zanden Audio 5000 Mk II DAC. I enjoyed the sound of the A32 so much that I made sure to use it with almost every speaker I had through for review in the same timeframe. These included the Ethera Vitae, Verity Audio Tamino, Polk Audio LSi9, and Ruark CL10. Speaker cables and interconnects were all Nirvana S-L series. Comparison electronics were a Redgum Audio RGi120 integrated amp and my reference Blue Circle BC3000 preamp and BC2 mono amplifiers. When Wes Phillips heaped praise on the DiVA A85 integrated amplifier, he didnt just say it was good. He went so far as to compare it to some of the best integrateds that money can buy. I admit to raising my eyebrows and thinking, Can it really be that good? After hearing the FMJ A32 at length, I can now understand his praise. Although the A32 does sound a wee bit better after a short warm-up, even straight out of the box I could tell that the sound of this integrated was something special. It was smooth, clear, and clean -- no, make that squeaky clean. If signal purity is what youre after, then the A32 gets high-fives all around, even when you compare it to products far more expensive. And as for "get up and go," the A32 has that too. A number of tracks on Buena Vista Social Club Presents: Omara Portuondo [Electra/Asylum 79603] are full of excitement and vigor. The ultra-precise A32 is quick on its feet and has agility that breathes life into the music. I was most impressed with the crystal-clear rendering of the vocals and the precision of the percussion. The stage is laid out wonderfully, and the musicians are easy to pick out in the mix. The A32's bass is tight, detailed, and controlled, but this is not an integrated amp that warms things up excessively or is "bloomy" in the bottom. When drums connect, their sound is incisive and without overhang or slop. My choral-orchestral test disc, The Mission soundtrack [Virgin 90567-2], is robust-sounding and laid out with a vast amount of space and pinpoint delineation of the voices in the choir. The sound with the A32 was razor-sharp. High-frequency performance, sometimes the Achilles' heel of solid-state electronics, has a lot to do with this perception of speed and precision. With the A32, it's clear, airy, and extended without a hint of being bright or edgy. Theres nothing nasty in its delivery, and there is nothing forgiving or warmed over to cover things up. If you have an overly bright or tizzy-sounding source (which the CD23T CD player is not -- its just as clean and extended as the A32), then you could run into problems. The A32's high frequencies were simply pristine with my system configuration, and this trait makes the A32 quite a revealing performer for use with the best components. In fact, I used it to critique high-end digital sources a number of times. I remember distinctly pulling out Jewels Pieces of You CD [East West 82700] for a listen. The recording quality varies considerably from track to track, but there are a number of times that Jewel's voice and guitar are captured nicely. The purity in the performance of the A32 let voice and guitar shine through with the utmost clarity. Jewel's playing has excellent attack and energy, and the high-frequencies are exemplary. Soundstage placement, in terms of both width and depth, is rock-solid and stable. Where there is credible soundstage placement left to right, front to back, and acoustic space all around, the A32 lets you see into the recording. The A32's midrange editorializes not at all. Its simply clean and there. Willie Nelsons aged voice on The Great Divide [Universal 586231 ] has a splendid combination of robustness and clarity. Norah Jones piano on Come Away with Me [Blue Note 32088] has such a crystalline sound its hair-raising. Attack and decay as the keys are struck are comparable to those of electronics costing many times the price of the A32. Heard through the excellent Ethera Vitae speakers, the sound of the piano was some of the best Ive encountered in my room, and with the CD23T in the loop, I declared this system combination to be an electronics-and-speaker match made in heaven. The A32 has a lot of finesse. The blare of a horned instrument or the subtle inflections of vocals are rendered with precision and the utmost clarity. However, some audiophiles may find this sound a little too exacting. Those who favor a warmed-up or grander-sounding midrange or a more bloomy bass presentation may be left a little cold with the A32. The only real caveat I have in terms of the A32's performance is its all-out power. One hundred watts is a lot, but its not everything. Certainly there will be a limit at which the A32 cries out for you to stop turning it up. But I never hit it, and I really doubt that many will. Speakers I used were all in the middle to high 80s in terms of sensitivity -- nothing extraordinary in that regard. But the A32 didnt blink. This isnt a cost-no-object arc-welding powerhouse, but it is a highly refined, top-quality, full-function integrated amplifier suitable for the majority of listeners speakers. Comparing the A32 to competitors is interesting because the performance level is high enough that you wont necessarily be picking which one is better. Rather, you are more than likely to identify differences -- and preferences. For example, I also like the minimalist Redgum Audio RGi120 from Australia that I reviewed some time back. Its a bit lower in price (starting at $1800), a smidgen more powerful (manufacturer rated at 120Wpc), and completely devoid of the A32's microprocessor functionality (it has a volume control, input selector, and little more). Next to the functionality, the sound is the two units' biggest difference. The Redgum is a little more robust and full-sounding, where the A32 is more exact and precise. I liked the RGi120 for how pleasant it sounds, but it doesnt have the crystalline nature of the A32. Although both unravel plenty of detail, Id have to say the characteristics of the A32 make it sound more transparent and resolving. On the other end of the spectrum are my long-term reference Blue Circle BC2 mono amplifiers and BC3000 preamplifier. The amplifiers are huge, exotic, tube/solid-state hybrid units that run in pure class A and have a single-ended circuit topology without any negative feedback. 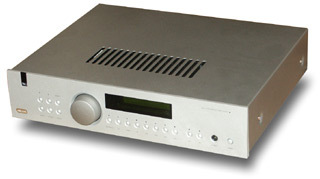 The preamplifier has a large and distinctive all-stainless-steel chassis, and its completely tube based. Its dual-mono design is replete with a double set of volume controls, input selectors, and mute switches. It's a heckuva lot more cumbersome to use than the A32. And it has an external power supply that weighs close to what the A32 does. The Blue Circle combo's sound is decidedly different from that of the A32. Someone could certainly criticize the BC2s bass for being too full, but with the right speakers, it is weighty and room-filling. When the Blue Circle electronics are fully warmed up (at least one hour, far longer than the A32 requires), they have the same level of purity and cleanliness about them as the A32, and there is a certain magic in the midrange that makes it sound more full. Finally, when the Blue Circle components are working at their best, they eke out a tad more detail. But the Blue Circle units are huge and awkward to place, and the amps run hot enough to heat my apartment -- even during a Canadian winter. Theyre also about six times the price of the A32 and completely impractical for many people. The point of this isnt to debate whats better or even whats more reasonable; thats for each person to decide. Its to put into perspective that Arcam isnt just offering a great integrated amp at the A32's price; theyre offering a great one, period. I never expected the rather diminutive and modest-looking Arcam FMJ A32 integrated amplifier to charge me up and get me excited the way it does. A quick glance at its understated appearance makes it look, well, rather ordinary. However, once I played music with it, I quickly realized that this rather shy-looking component is one of the finest audio values Ive come across this year. The A32 does nothing really wrong -- right down to its price. Its sound is clean, transparent, precise, and smooth. It also has stellar functionality with all kinds of little bells and whistles that modern-day consumers are asking for. I may be the type of audiophile who can eschew almost anything practical for the utmost in sound, but Ill certainly miss the convenience offered here. The Arcam FMJ A32 is a perfect blend of ergonomics, style and performance. And given this as well as its price, it's a terrific bargain.